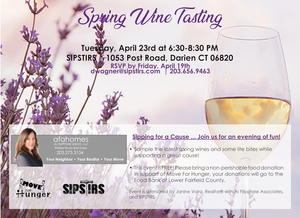 Please join us for a fun FREE event at SIPSTIRS located at 1053 Post Road, Darien, CT on Tuesday, April 23rd at 6:30pm-8:30pm. Sample and learn about the latest spring wines and enjoy some lite bites while supporting a great cause! Please BRING a non-perishable food donation in support of Move For Hunger. All donations will go to the Food Bank of Lower Fairfield County. EVENT is Sponsored by Janine Vairo, REALTOR® with AFA Homes, William Raveis Real Estate and SIPSTIRS.